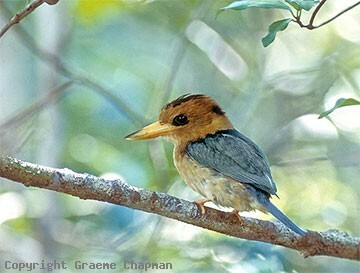 Yellow-billed Kingfishers in Australia occur only on northern Cape York Peninsula, south to near Weipa on the west coast and Silver Plains near Coen in the east. They also occur in New Guinea and some offshore islands. They rarely move far from rainforest and inhabit monsoon forest, vine thickets and other lighter types of rainforest or ecotones with open sclerophyll forest and woodlands. 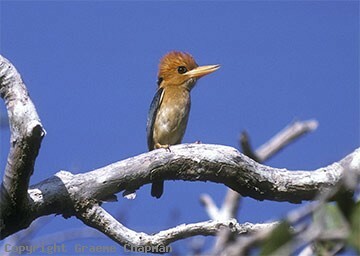 A fairly uncommon bird, little is known about their life history. They appear to inhabit permanent territories in pairs where they drill their nest holes into arboreal termite mounds. When feeding, they sit quietly in the rainforest and pounce to catch prey on the ground. At these times, they are quite cryptic and will allow a close approach - their greenish overall colouration blends well in the shadows of the rainforest. At the height of the breeding season, they are much easier to see because they sing well from high perches. 321201 ... Yellow-billed Kingfisher, adult male, singing from an exposed perch. 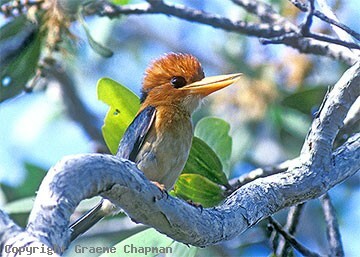 321203 ... Yellow-billed Kingfisher, adult male near the tip of Cape York. 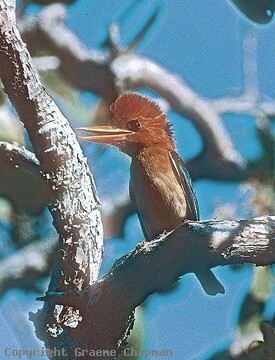 321204 ... Yellow-billed Kingfisher,female. They sit quietly in the rainforest when feeding.